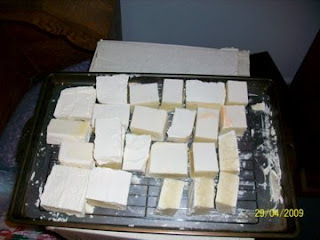 I made the soap several weeks ago and am letting it cure in the basement. This soap is wonderful, I use it for everything ,washing my hair, clothes, as a lotion, I mean everything! 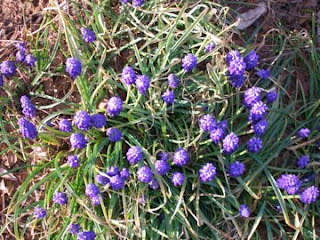 The recipe can be found on down---to---earth blogspot.com. It is not yet June almost but not yet and the slow work on the yard continues. 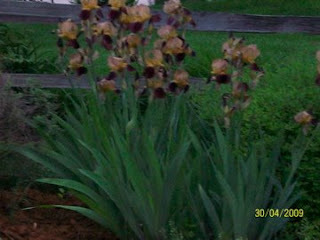 We have had so much rain that their has not been a full week end to work in the yard. So today the clothes line will be put up, some beans and zukes planted with a few more tomato plants. 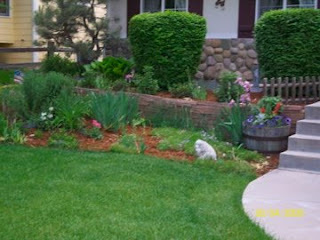 Mr.P put fresh mulch down out front which always makes things beautiful. 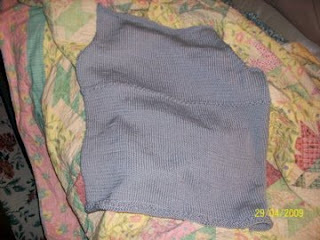 I have been working on a summer vest using King Tut cotton in a steel grey. I love the feel of this fiber, but the real test will be is the fit. I do not sew clothes for myself because I am never happy with resulting fit. Well the good thing here is if it does not fit me i.e; being to small then my daughters with great figures will be thrilled to have the garment. This is the back and the front is 1/2 way finished. Am not sure what has gotten into me, I am a far more active quilter, but for some reason lately I just want to do mindless knitting, sit in quite, drink coffee and knit. I am going to enjoy this while it last. My daughter found her wedding dress( no she is not getting married) and it is a knitted dress!! She sent the picture on the internet and said maybe I should start the dress now. I do not think so. 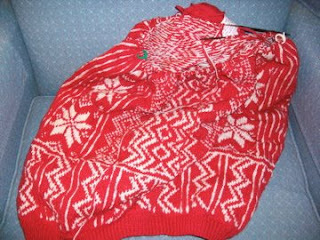 Can you imagine knitting a dress and then it does not fit how you imagined it would. NO THANKYOU. Hope your week end is a wonderful one for you. 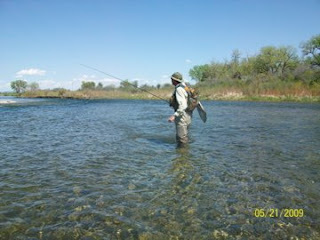 Another week ending, I have spent the week by myself as Mr.P was fishing on the Big Horn with friends from work. I enjoy spending time to myself ,but by the end of the week I really look forward to seeing and talking to Mr.P. My best friend!!! Guess what it is doing this week- end ! Yup, it is RAINING again and again. Suppose to rain the entire holiday week end. That means Mr.P. and I will be watching the last season of 24 and any WWII movies on the TV. We do enjoy week ends such as this but would prefer not every week end rain. 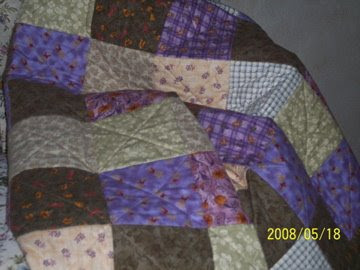 I have also been knitting, allot, and working on the quilt for China. 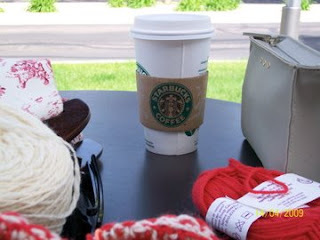 Knitting means also drinking coffee, allot of coffee. And since research is coming out saying coffee is now good for us, I am belling up to the coffee bar. 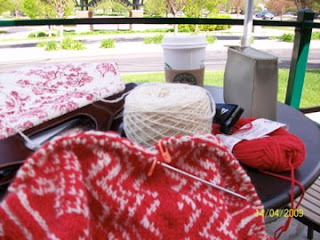 I love sitting outside knitting, drinking coffee and watching the world go by. OK my life is not all that interesting, so what. The yard is beginning to come along. The big planting for veggies will not happen til after June 5th . I would like to enjoy the yields when I return from China. Hope you are all having a relaxing week-end this Memorial Holiday. Let us also not forget what this holiday is about and all the Americans who have sacrificed love ones for our freedoms that we all enjoy!!! 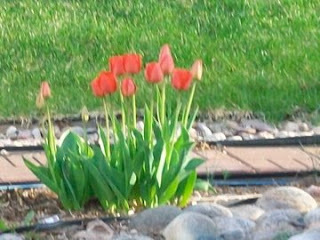 It is heating up here in Colorado. Yesterday 92 degrees. 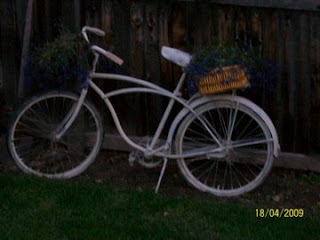 Last Saturday I spent the day painting outdoor metal chairs from black to white and planting the flower boxes. I had done the boxes once and when I saw my sisters planters, I knew mine were inadequate...so off to the stores again for variety of different plants. 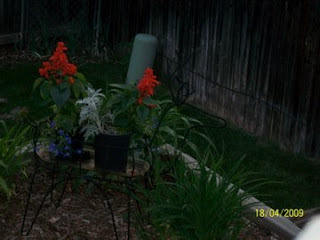 I enjoy beautiful flower planters, sitting out on the porch in the evening after it has cooled down a bit, oh the simple things in life ! I also finished a quilt that I pieced as well as machined quilted. I am loving this machine quilting. 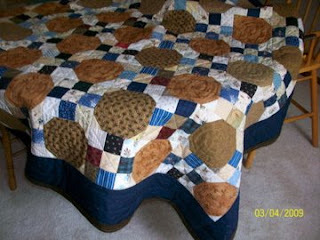 No I can not do all the real fancy quilting yet, but I know me and with time and practice I will be doing it all. Well the sun seems to finally want to warm the Colorado earth. Yes, all week we have had sun and warm temps. 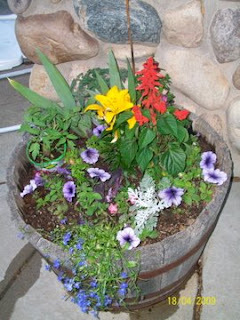 Today I need to get out to the garden and water the plants that are already planted, plus plant lots more. 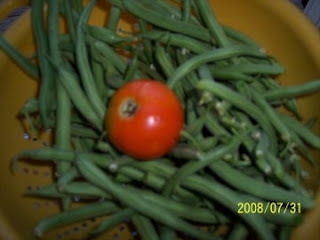 I plan on putting in some beans , lots of beans, we love to eat young fresh beans. Since we will be gone in August I need to plan the timing of the garden carefully. 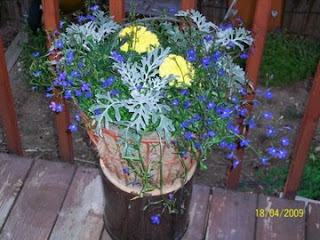 I want to be home to "put up" all my gardens treasures. Eating locally is a full time job and next year we will plan our trips around the "garden" season. Today I must admit I am a little put out. Mr. P is going to work at home and I had plans to do alot of projecs in the house. When he is working at home the upstairs is his office, so I get nothing done. No cheese making today, no music played loudly to vacuum to, no nothing but I do get to listen to news reporting the stock all day and at a volume that I want to pull my hair out. Do not get me wrong I like Mr.P to work at home but I like a heads up to the days so I can plan appropriately. I had so been looking forward to my day off by myself and to get things accomplished and now it is a bust. Well when the day starts off looking "scrappy" I guess I will work on some quilts. I could start a quilt for my daughter, get my nails done ,I could even get some knitting done. The Dale sweater progress has slowed way down again, I can not seem to make it pass this crazy row with out making a mistake. Every time I think I finished it correctly on the following row I realize I made a mistake,grrrr. All right I think I can get up and make this a wonderful day. I just need to re-arrange my plan, be a little more flexible. I may not get my house clean, but I can get some sewing done. I will also run over to The Little Wool Shop and look at some Amy Butler patterns. Yes this day is starting to look up. I hope your day is good and remember to be flexible!!! Guess what it is doing this weekend, yeap you guessed it....RAINING. I ran, drove down to Littleton for the Paris Street Market, my favorite of the year. I found 2 black, soon to be painted white 1950 metal chairs, a big beautiful watering can, a 1950's table cloth and another green vase. So I must say I had a good day. Pictures of all to come as soon as it stops raining. I have been working on some gifts for my daughter in China, she has a birthday coming in June. So more on that later. Hope everyone has a wonderful Sunday, try to find your ray of sun in the day.